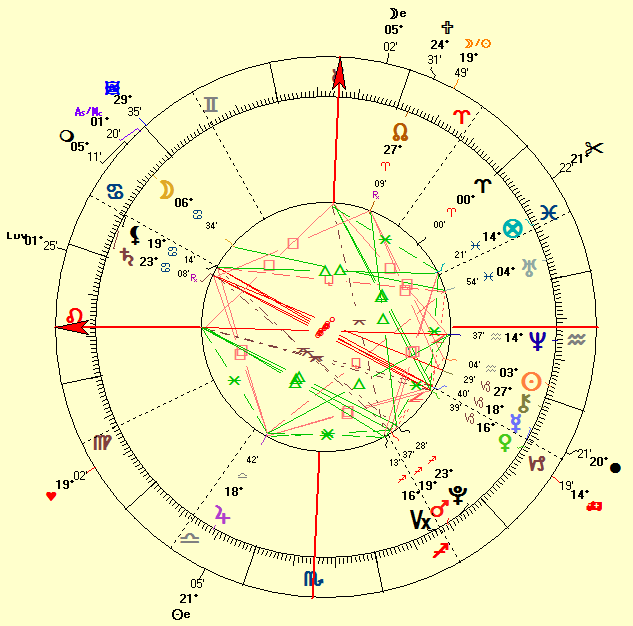 Donald Trump was born on June 14, 1946 at 10:54 AM EDT in Jamaica, Queens -- New York/USA (40 N 41 /73 W 48) (source: AstroDatabank, Rodden Rating AA). As usual we look at the standouts in the natal chart. After all, that's what will bring us to the essence and disposition of a person. Not to overwhelm you with information, we will only assess the horoscope of Donald Trump by looking at the factors that only have some meaning for his love life. there is a powerful Saturn-Uranus connection (the ruler of the 10th house, mundane ruled by Saturn, is in the 11th house, mundane ruled by Uranus; Uranus is in the 10th house, mundane ruled by Saturn; Saturn is in the 11th house, mundane ruled by Uranus; SA = AS/UR). His predominant fire element suggests a flamboyant and lively nature, the more so because his Ascendant is in the fire sign Leo as well. Fire signs are enthusiastic and showy (especially Leo). On our sign compatibility page, we already mentioned that predominant fire signs make themselves visible, noticeable. You not only hear them, but you will see them physically too because they just love to 'show up' and make some 'drama' and noise. Planets in the eastern hemisphere of the horoscope wheel indicate a self-reliant person who is very much interested in our society due to the strong 4th Quadrant (houses 10, 11 and 12). The powerful Sun-Pluto connection, analogy or affiliation represents compulsive-obsessive drives. There are huge power issues and he may be quite forceful - for good or ill. The powerful Moon-Venus connection loves harmony and beauty. It's a rather naive connection also suggesting Donald Trump tends to take life easy. This connection confirms and even reinforces his mutable Full Moon with the Lights posited in double signs. The advantage is that he has the ability to blend contradictory points of view but on the other hand, it's still a very divided connection, so that he really needs to be clear about his own points of view. He should avoid 'double-speak' and try to learn to have a vision on his own. Any Saturn-Uranus connection brings tension and stress in the life of the native also. The Full Moon in double signs is a very idealistic one. He's able to focus his desires on one single object and pursue that object with full force and passion. In matters of love, this Full Moon phase is not able to settle down easily though. He also has to learn to manage and master the opposites that manifest within his own personality. In Sagittarius, this Full Moon struggles between reform and tradition (confirmed by the powerful Saturn-Uranus connection), between the beliefs/concepts and the more rational parts and he may often choose the most emotionally appealing solution to problems (confirmed by his predominant fire traits). The Sun-North Node conjunction reinforces self-conscious behavior. Donald Trump is able to personally push through. The Moon opposite the North Node of the Moon on the other hand points to the wrong connections with some people. He may have tons of encounters and meetings but he often has the wrong ones that rather block his progress. This makes for vacillating and/or short-lived contacts with numerous people. to Ivana Zelnickova on April 9, 1977. The couple divorced on March 22, 1992.
to Marla Maples on December 19, 1993. The couple divorced on June 8, 1999.
to Melania Knauss on January 22, 2005 in Bethesda, Palm Beach, Florida/USA around 19:00 (07:00pm) in a most expensive 30 minutes society wedding. Let's take a look at his current marriage to Melania Knauss. The marriage horoscope below is calculated for 19:00, the estimated time of the marriage. And again, we will only look at what stands out on that very moment even though there are not a lot of configurations jumping out. There is one exact midpoint noticeable in the 45° dial: UR = VE/SA = SO/MO. This is a very disruptive and turbulent planetary picture that we rather don't want to have in a wedding horoscope. It increases the likelihood of separation and divorce. There also is a tight Saturn-Pluto inconjunct (both bodies being at the same numerical degree as well). This Saturn-Pluto inconjunct is not that important because it's a generational aspect but it may have some relevance if we take the house rulerships into account. 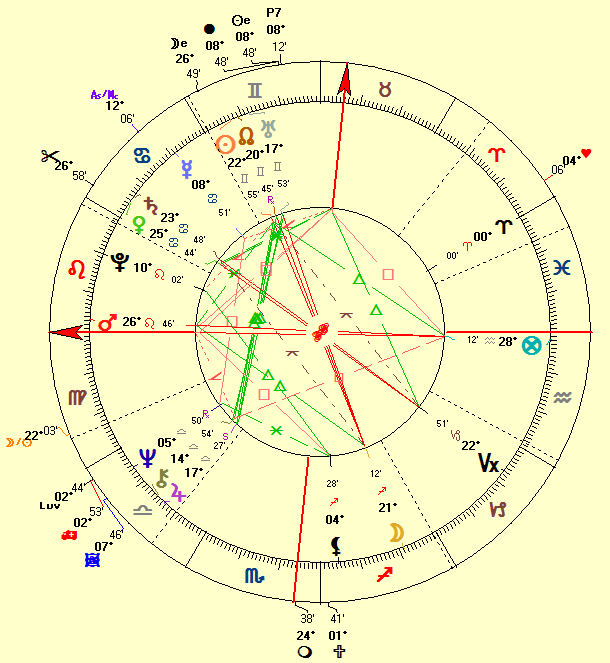 Pluto may rule the 4th house while Saturn may rule the 6th house (if the time of the wedding is approx. accurate). In this case, there may be some issues between the family and home life and work. Both life domains are not really compatible and this may bring about some frustration. Most Saturn-Pluto aspects can be very rigid, tenacious, stubborn and fixed though (most often because of jealousy and/or control issues). The other tight aspect is the square between Mercury and Jupiter. Expansive Jupiter often exaggerates and with Mercury there can be misjudgments. There are big expectations but also some disappointments to take into account. Generally, this is not too bad an aspect and often it involves big expenses and purchases. Click here to download his Astrodamus predictions till 2030. Update January 20, 2017: Donald Trump was sworn in as the 45th president of the United States on January 20, 2017 at 12:01pm in Washington DC.